Genetically Modified Organisms (GMO) are in so many food products and you don’t even know. Many of these foods contains pesticides that were designed to kill bugs, don’t let it kill you. I invite you to learn more about GMOs by watching this short video. Dr. Oz talks about GMO foods with leading authorities on GMO foods. You are probably eating genetically modified foods and don’t even know it. As much as 80% of all packaged foods contain GMOs (genetically modified organisms). You have the right to know what you’re serving your family. Keep reading to learn all you need to know about GMOs and what they mean for your health. More…..
To watch the show video, please view all 3 videos to see the entire show. Part 1 starts here. Adopt a Non-GMO diet buy smart using this helpful Non-GMO Shopping Guide. To get an ipod/iphone app scroll to the bottom of the page on the link provided. Product Introduction– Bella Vita Oils is our sponsor and new products will be discussed. Digest + Cleanse™ soothes gastrointestinal upset and supports healthy digestion. * Stress, overeating, and toxins can irritate the gastrointestinal system and cause cramps, gas, and nausea that interfere with the body’s natural digestive and detox functions. Supplementing with Digest + Cleanse will soothe the bowel, prevent gas, and stimulate stomach secretions, thus aiding digestion. * Digest + Cleanse is formulated with clinically proven and time-tested essential oils that work synergistically to help prevent occasional indigestion and abdominal pain. * Precision Delivery softgels release in the intestines for optimal absorption and targeted relief and to help prevent aftertaste. This product can also be used in conjunction with any cleansing program, such as Young Living’s 5-Day Nutritive Cleanse. Digest + Cleanse is part of the new Purely Oils line of premium essential oil supplements. Personally I am going to do a five day cleanse to clean up the toxicity that GMOs have created in my system. I have been suffering from Inflammatory Bowel Disease, Diverticulitis and Breast Cancer (Invasive Mucinous Carcinoma) all in the past year. I wish I had known earlier the health effects that GMOs have on the body. To order some for yourself first set up your account to become a customer and ordering is easy. For more information about GMOs I invite you to watch the movie, “Genetic Roulette”. Below is a movie trailer for you to watch. To view the entire documentary movie, which I encourage you to watch…it is eye opening and educational about the food you are eating. What can you do? For everyone including non-California residents, you can make a difference too. DISCLAIMER – Please note that the information in this blog, while researched and documented, is not intended as a substitute for medical advice. Please seek the advice of a physician for any specific health condition, treatments or recommendations for alternative treatments for your health care. Welcome to Ba Ba Blacksheep a podcast hosted by BowPeep for all the fiberholics out there. I’m glad you dropped by and I hope you enjoy the show. Put yourself on the map. 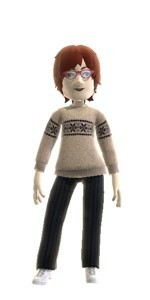 Hi, I’m BowPeep a shepherdess who is a fiberholic. I wish to remain anonymous, one…I’m not an expert and secondly I wish to protect the innocent. I have learned a lot and want to “Pay it Forward” by sharing things I’ve learned along the way. If you discover who I really am, please keep it a secret and instead experience the joy of “Pay it Forward“. You can listen to this episode here. I’m working on a lace project, but I can’t talk about it. The giftee may be watching or listening. I’m also working on my son-in-law’s birthday socks. Did I mention his birthday was last month? Rep weave rag rugs sitting on the big loom waiting for me. This project is feeling neglected. “It is better to have tried and failed than to have never tried at all.” Don’t say you can’t do something unless you’ve tried. Knitting heel flap stitches on the top of the sock….ugh. Off topic Topics or Guests– Discussions on the various fiber crafts, each show will look closer at aspects of a particular craft or an occasional guest. Songs to Spin By– some music to spin or knit by, featuring a new artist or song each show. Please take time to make a donation to the podcast. Thank you for listening, see you next time. 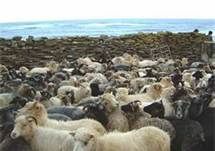 The sheep got shorn and didn’t recognize each other. 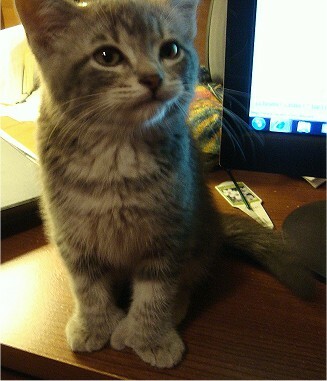 Mitz the kitten gets “fixed”…he wasn’t really broken. I finished plying some Shetland into a 3 ply. 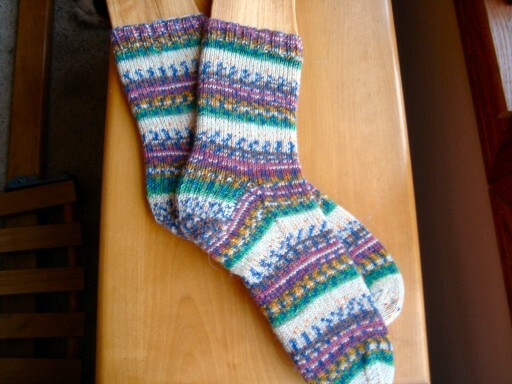 I finished the socks from the yarn I have been spinning forever…”Grateful Thread II” colorway by Yarn Hollow. 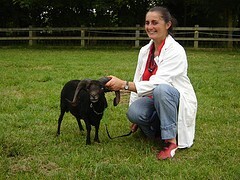 A different twist this time, I talk about goats, Scaredy goats…more commonly known as “fainting goats” or “myotonic goats”, “Tennessee Fainting Goats” and other names. Are you a “Scaredy Cat”? Running out of yarn for a project. 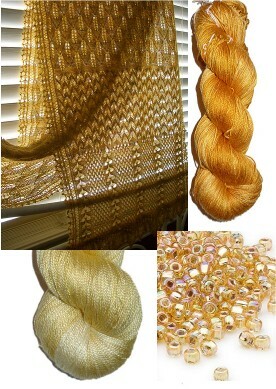 How to work through mill cuts in your yarn, difficult in pattern dyed yarn. Claw Pattern #1 and Claw Pattern #2 May 10 and May 11 in the calendar featured in From My Bookshelf below. 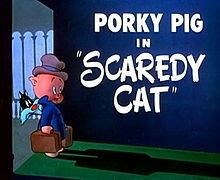 “Scaredy Cat” – did you know it came from a cartoon? 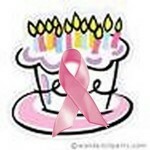 Update on my treatments, progress and my life after breast cancer. Healing School that I’ll be attending through my church next week. I finished spinning “Grateful Thread II” colorway by Yarn Hollow. 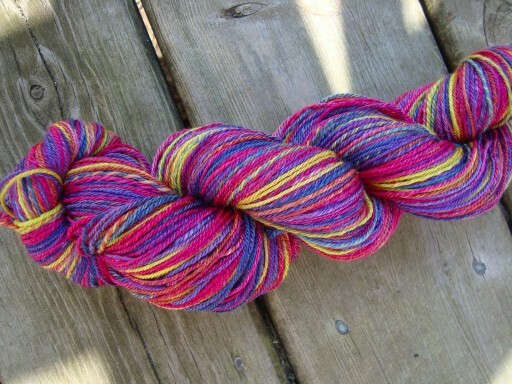 I did a chain ply (aka Navajo Ply) for this yarn in order to make it into sock yarn for daughter’s socks. The fiber is a 50/50 blend of Superwash Merino and Tencel fiber. It is VERY colorful….just what the daughter loves. Finished the pair of “to small socks” that I gave my radiation tech and she loved them! 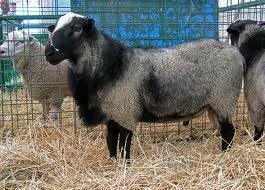 Ouessant (pronounced weh-SAHN), the smallest sheep breed out there. 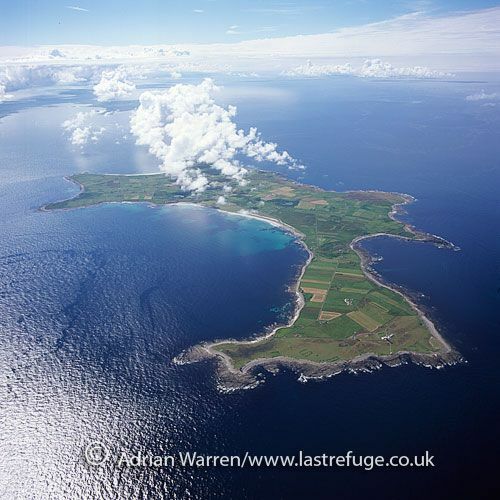 Their dimunitive size is due to the small area where they are raised, which is Ouessant Island about 12 miles west from island of Brittany. Here’s a picture that features a woman in order to show how small they are. The sweet things in life. Pulling out a wad from the center of a ball of yarn. Down to the heel flap without enough stitches. My fix was to pickup extra stitches and I explain how. Army of Women – find out more about this organization founded by Susan Love Research Foundation’s Love/Avon’s Army of Women. It is an international organization and accepts both men and women, from all backgrounds, from all over the world. Studies are being done with women and men who have had cancer and also people who have never had breast cancer. How to sign up – signing up just means that you are open to receiving emails about the various studies that they are currently doing. You are NOT obligated to participate in any study based on signing up. Send an invite to a friend – do you know someone who might be able to help? Current studies being done – these are just some of the studies, to see the full list and details please go to the link provided. and there are more studies being done. To see the most current and comprehensive list please visit the Current Studies page. You can find more about Jenni Alpert by using the link above or on her picture. Your donations keep the showing coming and they are very much appreciated. You can go to my website and on the front page on the right is the link for the Etsy shop for Finn roving. Teddy, the smallest of the triplets died on Christmas day. We will surely miss him, but he is no longer suffering. Chickens are laying eggs again. Some are frozen and crack, but the big dogs like them. Spinning “Grateful Thread II” colorway by Yarn Hollow. Working on the singles now and will chain ply this into sock yarn for daughter’s socks. 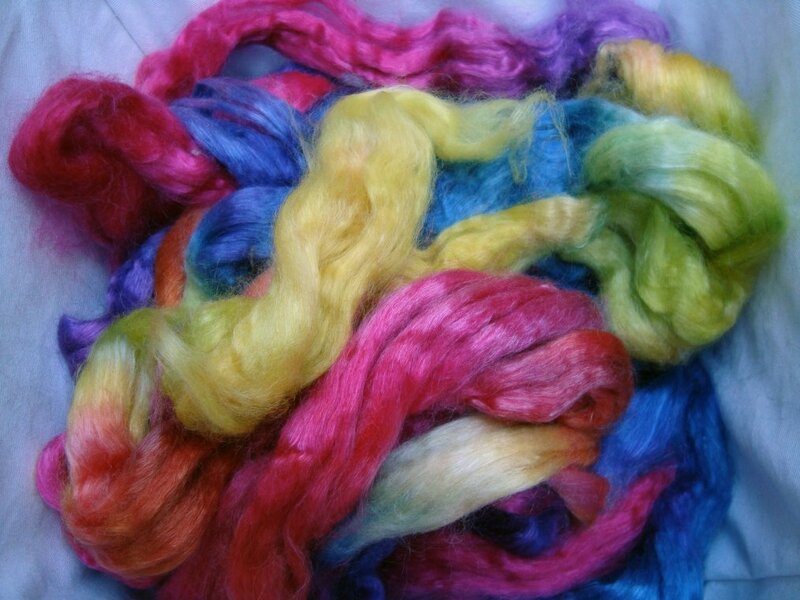 The fiber is a 50/50 blend of Superwash Merino and Tencel fiber. It is VERY colorful….just what the daughter loves. I’m almost done with the singles. I’m healing enough to start spinning again. I want to chain ply (Navajo ply) these and it will take a lot longer to do the motions with my post surgery limitations. But I’m determined to get this done and on the needles soon. I finished the “girl power socks” and gave them to my friend but I forgot to take a picture. I am working on the “socks that are to small” and started knitting a Balaclava for hubby out of 100% Angora wool in black. Kitty chews my cables on my needle. The “socks that were to small” find a perfect home. I am also reading the Bible everyday as part of a Bible study at our church. Join Ravelry if you haven’t already. Teddy, the smallest of the triplets is sick. Antibiotic treament is started but not enough improvement seen. I called the vet and switch antibiotics and do a worming (per the vet) the day before my surgery. Socks that I was working on are “resting” while I knit up a pair of socks for a very special friend. They are pink for “girl power” and I had intended to have them done for her by Christmas. The second sock is just past the ribbing, so there’s a ways to go to get them done. 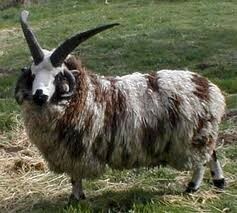 The origin of Jacob sheep is first mentioned in the Bible in Genesis 30:29-43. Second chances. This is priceless gift that you can give someone. Unfortunately my father didn’t have that second chance he had thought he had. My dad passed away Dec 20, 2011, the day before my surgery. Time….don’t wait for someday, it may never come. Appreciation of those we love or friends we care for. Remembering to say thank you to all of you that have supported me. Santa at the end was hubby, surprising me at the end of the reading of the poem. “Laying down with the lambs” in Isaiah 11:6-9. 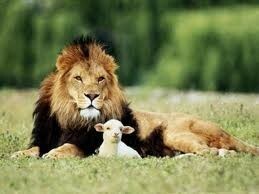 “And the lion shall lie down with the lamb” from Nature’s Corner. What I’m anticipating for my surgery. My dad had a minor heart attack on Thursday, Dec. 15, 2011, a second heart attack that was massive on Dec. 17, and the third and final one actually ruptured his heart. 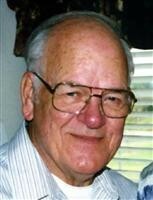 My dad passed away December 20, 2011, about 8 PM. I learned of his passing just after recording this episode. I miss my dad so much. 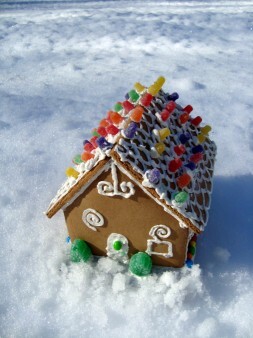 Ravelry Tips will continue on the next episode…stay tuned. You can find more about Jerry Garcia using the link above or for his CD that features the Song to Spin and other Christmas songs in this episode click on the CD cover to the right. Please take time to make a donation to the podcast. Your donations keep the showing coming and they are very much appreciated. Spinning “Grateful Thread II” colorway by Yarn Hollow. Working on the singles now and will chain ply this into sock yarn for daughter’s socks. The fiber is a 50/50 blend of Superwash Merino and Tencel fiber. It is VERY colorful….just what the daughter loves. I’m about halfway done with the singles so far. Started spinning some 100% raw alpaca from a local farm. Plan on finishing it and doing a chain ply. I’ve decided to comb out the flakes of feed and wash the rest to blend with some of my Finn that I naturally dyed with black walnuts. Still working on all of the above. The Bubbles Scarf by Lucy Neatby. Second sock is getting finished, I’m working on the foot now. Shouldn’t be long before it’s finished. I’ve got another pair to knit before Christmas so I better get crackin’. 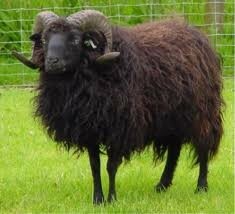 This section of the show will return next episode where we will be studying the Jacob sheep. Knitting the heel flap stitches on the top of the sock. Haven’t I done this before? You’d think I’d learn by now. they have been a fantastic source of support, encouragement and love. The requirements to be in that group are not ones that we wish for anybody, so we “unwelcome” each other. But we find that we are NOT an army of ONE….we have back up…we have back up. You can find more about Jason Silver using the link above or for his CD that features the Song to Spin by this episode click on the CD cover to the right. Please take time to make a donation to the podcast. Thank you to Elseline Thelma from Hampshire in the UK, Jean from NH, Ursula from WA for your donations. Your donations keep the showing coming and they are very much appreciated. Thank ewe for your donation.